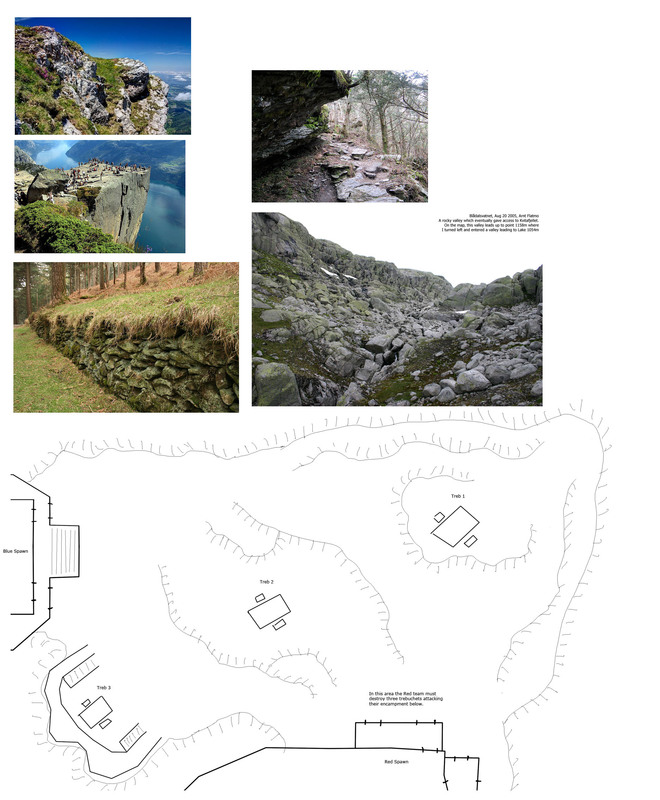 Plans for my Chivalry map and the future! So over the past week or so I’ve been dreaming up my next project. Lately I’ve been playing a fair amount of Chivalry: Medieval Warfare with my friends and we’ve been having a blast. Not long after I started playing Torn Banner announced they were going to release the SDK in the future, which coupled with my love for the game, spurred me on to design a map for it. Chivalry runs on the Unreal engine, which was why I mentioned I was getting to grips again with the UDK in my last blog post, and I’ve learnt quite a lot of useful things about the UDK since picking it back up. Before I make my map I shall be carrying out a few tests to ensure I fully understand everything I need to know to complete the map. The tests will include making materials, such as stained glass, and new gameplay objects unique to my map such as rocks being dropped from the walls instead of pots of burning oil found in the official maps. More to come on the progress of these in the future! The map is set in the countryside on some rolling plains in the middle of summer. Nearby there will be a large lake and off into the distance there will be mountains visible. Players will start near a large hill with a castle keep built on the plateau. At the bottom of the hill there is a small town within the castle walls. Below I have broken down each area with a couple of paragraphs explaining the game play found there along with some images to give a sense of the mood/feel I am going for with each area. The initial area of the map begins on some plains next to a large lake. The objective in this area for the Red team is to push a battering ram to Blue teams gate. Once there players will need to bash the gate down. Blue team must prevent the Red team from accomplishing this. This area will features grassy plains, pathways, streams and bridges for the players to battle on. The battering ram will follow the road, turning to take another road due to a destroyed bridge. Once it has crossed the secondary bridge it will reach the castles walls and gate. Along the route there are choke points and alternate paths for players to take to flank the enemy teams. The small lines coming from the main lines are areas where players cannot climb. These raised areas will give archers a slight height advantage, whilst the rolling plains will mean players will constantly change heights, making them slightly harder targets for the archers to hit. Players using melee should seek higher ground in fights since the height advantage will make hits against the enemies head easier to land. From the plains players will be able to see the castle on top of a large plateau, showing them where their battles will lead to should they reach the finale. 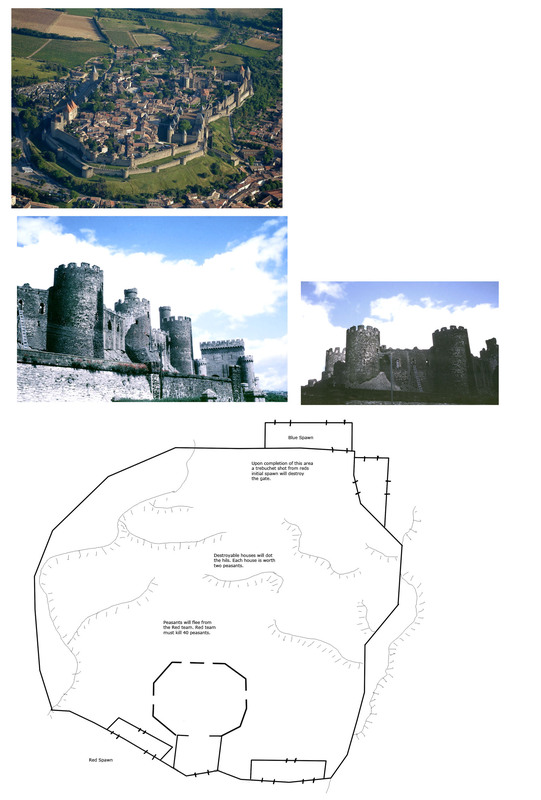 The second area will see the Red team tasked with pillaging the small town at the base of the hill up to the castle. The Red team must kill 40 peasants whilst the Blue team must stop them. The town is based on a slope with multiple levels for players to battle on. It will also give players some nice flanking opportunities whilst giving the defending team a slight height advantage. There are burnable buildings on the hill which the Red team can burn to gain two peasant kills. 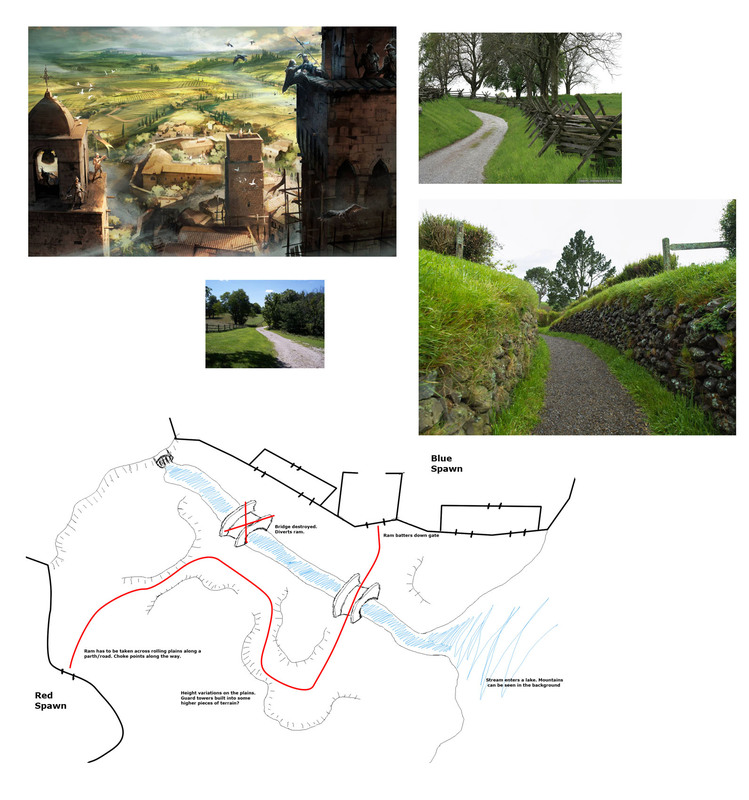 The area will take place within the castle walls and the buildings will be made of wood and straw, save for a few stone structures, such as a church. There will also be market stalls and other burnable structures populating the area. Once the Red team has cleared this area a short sequence shall play where a trebuchet from the Red teams initial spawn will fire a rock at the gate, allowing the Red team through to the next area whilst blocking the Blue team from coming back to this area. Area 3 see’s the Red team tasked with destroying Blue teams siege equipment. To destroy the trebuchets the Red team must place two members of their team on the pads next to the equipment. Standing on the pads for a set time will destroy the trebuchet. Blue team is tasked with stopping the Red team. The battle here takes place upon the plateau in front of the main castle keep. The area is quite hilly, with two trebuchets placed on raised areas and another placed within a depression in the land. This should allow for some interesting game play as well as the use of the terrain for flanking manoeuvres. Players will also be able to be knocked off the edges to fall to their deaths. The final area is where the Blue team must defend their king. The player with the highest points on the Blue team when the Red team reach this area will respawn as the king. The king has increased health and a number of weapons to choose from. Red team must kill the king to win the level. Players will fight within the kings throne room. The Red team has multiple entrances into the throne room. 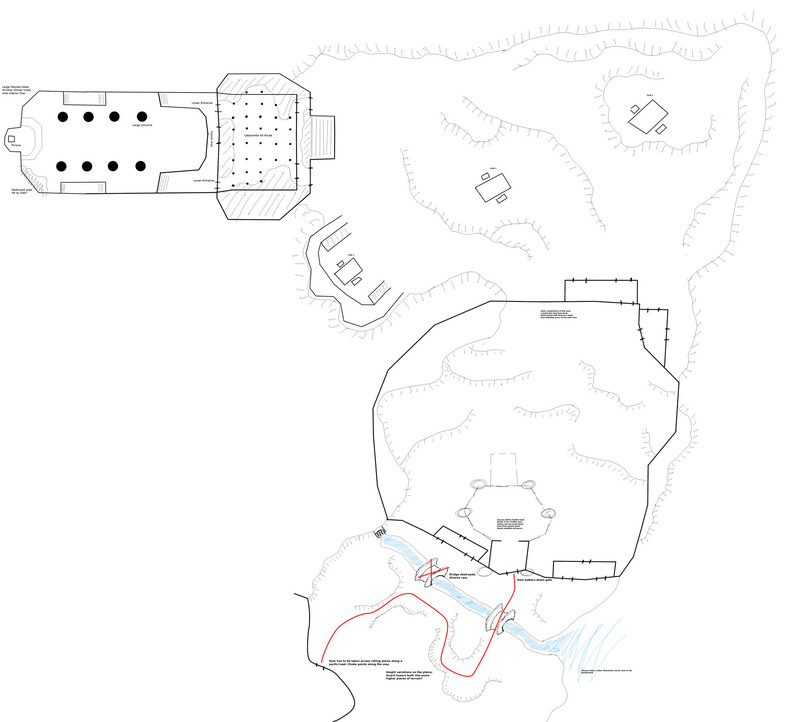 They may either take a lower route through some small catacombs and into the lower area of the throne room. Or they may enter the keep from the front entrance, through a banquet area and out onto some balconies within the throne room. 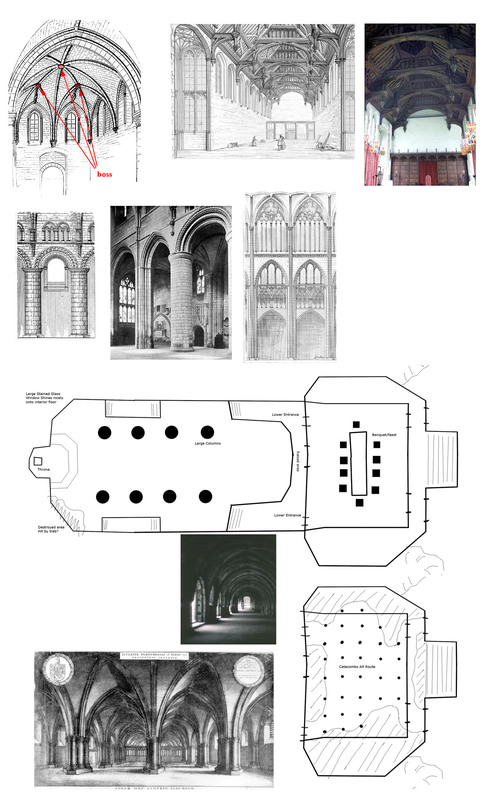 The throne room itself is lines by huge pillars with a large arched ceilings between them. At the end of the room above the throne there will be a large stained glass window with coloured light shining through into the room. The pillars, raised and lowered sections should give players plenty of opportunities to take different routes through the level to reach the king. It will also allow the king and the Blue team to block line of sight from the Red teams archers. The map itself will support all of Chivalry’s game modes which include Free-For-All, Team Deathmatch, Capture the Flag and these will take part on a closed section of the map, whilst the Team Objective mode explained above will make use of the entire map. Furthermore to creating the map itself I shall be creating a fair amount of custom content for the map. This will include standard props such as weapons, furniture and any detailed meshes to buildings and destructible objects. I shall be making these using 3DS Max and Photoshop and will include some high poly meshes for normal map generation created in either ZBrush or MudBox. I would like to hear any feedback or comments you may have on the design of the level. Are there any problems you think I might face? Is there anything you’d like to see in the level which I have not included? I’m always open to feedback, and since it will (hopefully) be you guys playing it I want you to enjoy it!